Cute Unicorn Design: it is an excellent and amazing gift to your friends, families, colleagues or youself. It is usb drive, and also lovely decorations. High Speed Chip: USB 2.0 specification, with high data transfer speed. Data reading speed: 15MB-20MB/S, Data writing speed: 7MB-10MB/S.Safe and reliable: repeatable erase million times, the data can be stored for 10 years; anti-magnetic, earthquake, moisture, high and low temperature resistance. Real capacity A-class flash chip: it is very safe to keep your data in the usb drive without any problem ( NO data missing, or File Corrupted). You can store all your business presentations, homework, personal documents, photoes, videos, and so on. 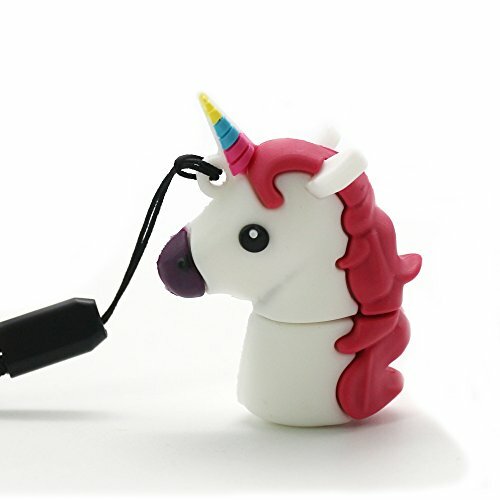 The Unicorn USB drive have more advanced design and crafts. the ear of unicorn is firmer, and connecting part is more suitable. What you get: 1 * Real Capacity 16GB Unicorn Usb drive, 1 * sling, 1 * storage box. If you have any questions about this product by DBigness, contact us by completing and submitting the form below. If you are looking for a specif part number, please include it with your message.